The Christian Directory stands out among later Puritan literature, Dr. Timothy Keller calls this “the greatest manual on biblical counseling ever produced.” Dr. J.I. Packer says that,” next to the Bible, this is the greatest Christian book ever written. ” No Puritan work on applied theology has approached the popularity, scope, or depth of this treatise. With widespread interest in counseling and practical, biblical living in today’s church, this of all Baxter’s works should be welcome to anyone who wishes to give solid scriptural answers to man’s most important questions. In the Christian Directory Baxter emphasizes the “heart work” involved in doing everything to the glory of God. 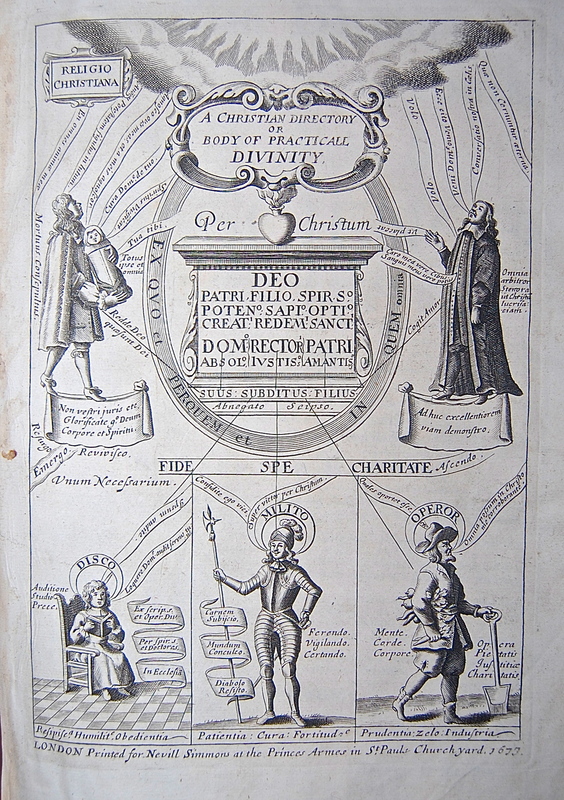 A Christian Directory: or a summ of the practical theologie, and cases of conscience. Directing christians, how to use their knowledge and faith; how to improve all helps and means, and to preform all duties; how to overcome temptations, and to escape or mortify every sin. Folio, 14 x 9 inches. Second edition. The first edition appeared in 1673. 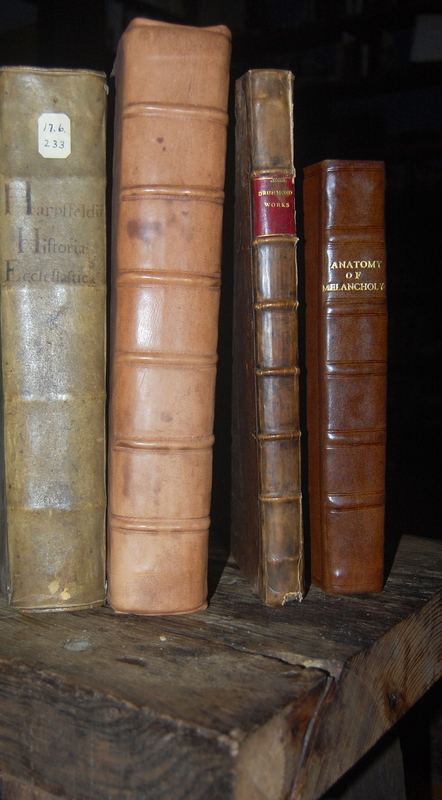 Part 1 (leaf B1r) and Part 3 (leaf ³A1r) each have separate title page, dated 1677, pagination and register. Part 2 (²A1r) has separate title page, with imprint “printed by W.R. for Nevill Simmons, … 1677”, pagination and register. 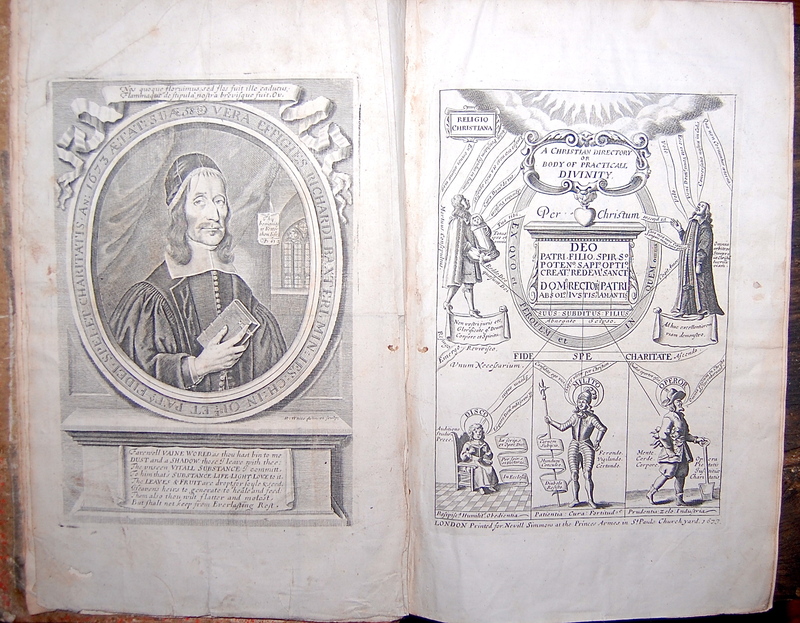 Part 4 has separate title page, with imprint “printed by William Rawlins for Nevill Simmons, …. 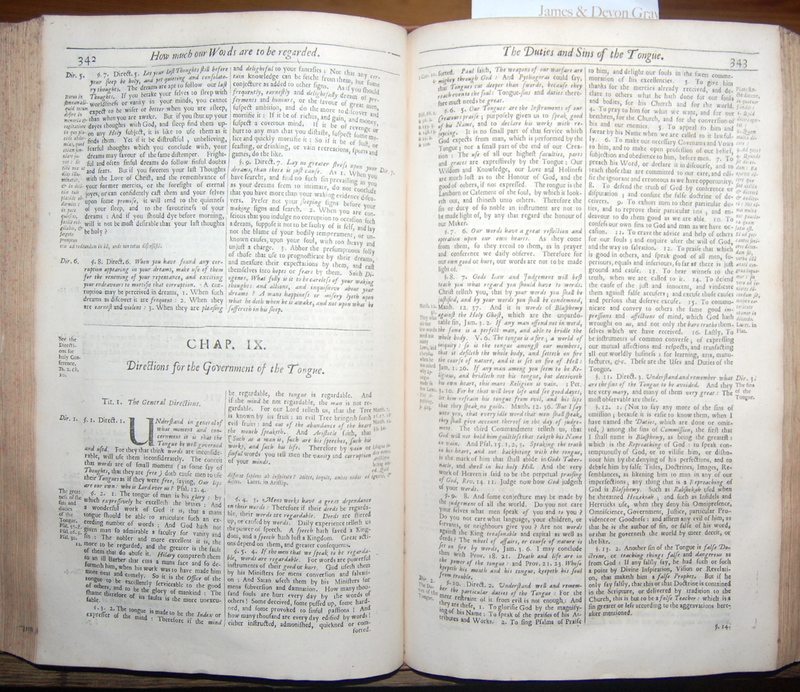 1677” and pagination; register begins with quire 7A. Leaf 7A2 missigned 4A2. 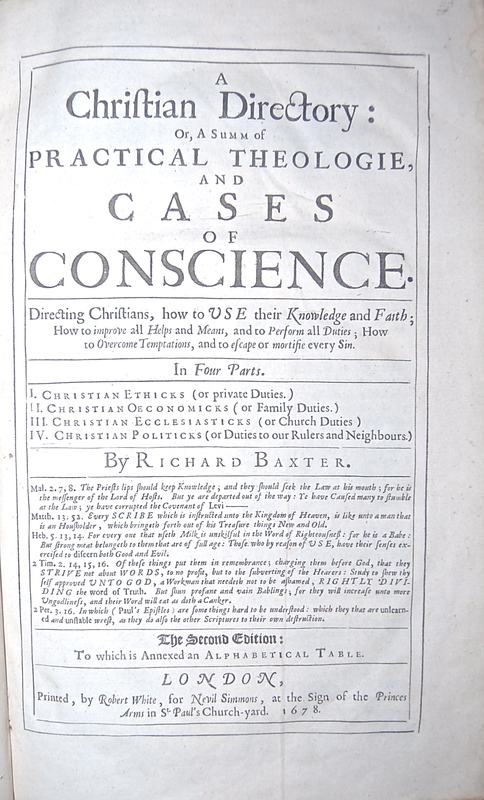 “Cases of conscience about matters ecclesiastical,” has separate title page, dated 1677 on leaf ³L3r. This copy is bound in early boards which have been rebacked in modern calf the boards remain un covered.. It is a good solid copy of a large book, with only some slight intermittent browning. Baxter was a nonconformist theologian and prolific writer of devotional literature. Ordained as a Presbyterian divine in 1633, he had no formal education but taught at Worcestershire; he went on to serve as chaplain to both Cromwell and Charles II. His cardinal theme was always that of reconciliation, humility, and reason. In 1660 he refused to sign the king’s Uniformity Act, and was subsequently jailed for several months and banned from teaching. Richard Baxter had an amazing and difficult life, There are too many biographies of him and they vary greatly in slant and reliability. The excerpt I give here I think fits well what I read in Baxter. 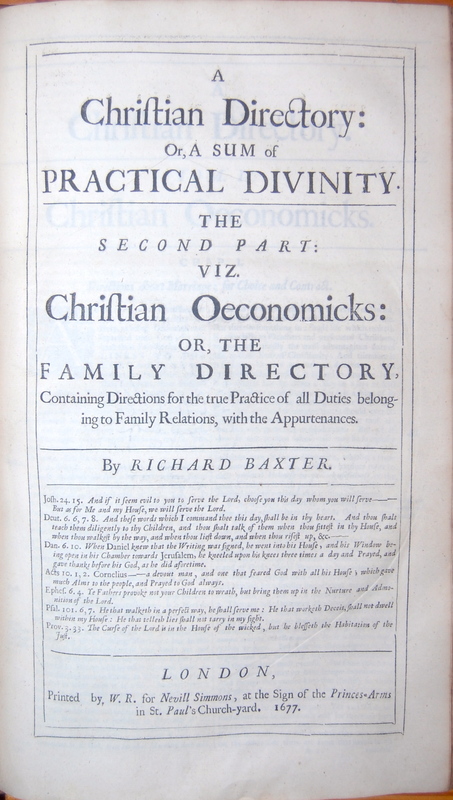 A Christian directory or body of practicall divinity. … 1677.
son of Beatrice Adeney and Richard Baxter, Sr. Because of his father’s gambling habit and inherited debts, and his mother’s poor health, Richard lived with his maternal grandparents for the first ten years of his life. 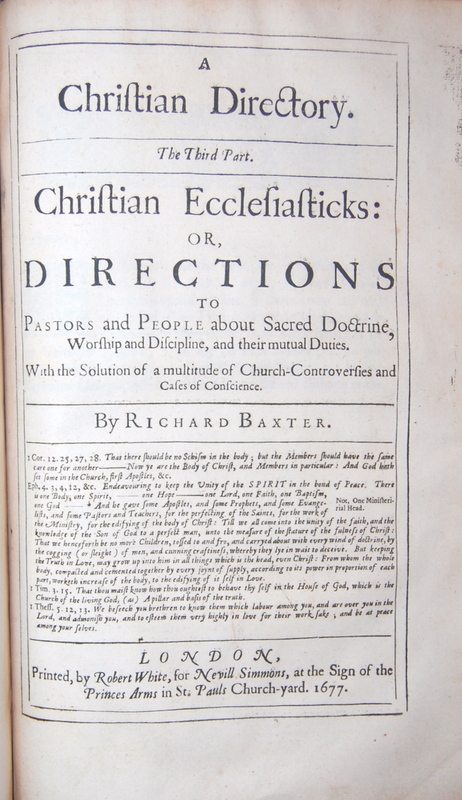 When his father was converted through “the bare reading of the Scriptures in private,” Richard returned to his parental home, and later acknowledged that God used his father’s serious talks about God and eternity as “the Instrument of my first Convictions, and Approbation of a Holy Life” (Reliquiae Baxterianae, 1:2-4). Baxter is the Big one!